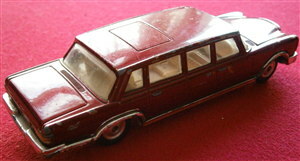 Mercedes 600 LWB Pullman, made in Swansea Great Britain from 1964. 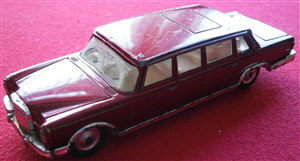 It is finished in metallic Red, with Cream trim LHD. 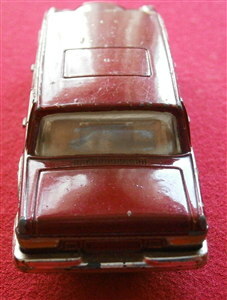 It has the unusual feature of working wipers, gear driven from the rear axle. It even has an on/off switch. 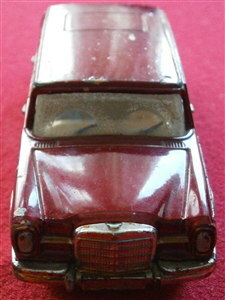 The model is in very nice used condition, with a few small marks. Unfortunately, the bonnet star is missing. Important Legal Notice:-This site is not officialy sanctioned by the manufacturers, and as a general comment, all photos, logos and other proprietary content belong to their respective owners (i.e. We are not trying to violate any trademark or copy rights. If something is here that should not be, let us know and we will remove it.Every trade mark name is the property of their respective owners.